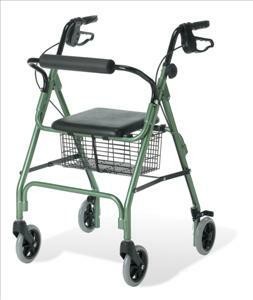 Weighing 15.5lbs., the lightweight, anodized aluminum frame with 6" wheels loads into vehicles with ease. Loop style brakes control speed and easily lock wheels while seated. Padded seat and backrest provide comfort. Store personal items securely in basket underneath seat. Weight capacity 275lbs. Blue.